BurningIssues.org • View topic - Media Bias for Biomass Energy? Media Bias for Biomass Energy? segment that left out the air emissions and forest impacts of biomass energy. The media is finally starting to pay attention to the growing trend of cutting down forests for biomass energy. Unfortunately, according to a recent survey conducted by The Biomass Monitor, this attention seems to be biased. In fact, 76 percent of U.S. daily newspaper articles covering forest biomass energy over a six-month period from October 15, 2014 through April 15, 2015 entirely ignore the health and environmental impacts of this controversial energy source, including air emissions, climate impacts, and ecosystem degradation. Seven of the articles mention negative economic impacts of forest biomass, and four cover nuisances, specifically concerns with truck traffic and noise from chipping trees. These figures are specific to forest biomass reporting, and do not include coverage of corn-based ethanol or other types of biofuels. In the US, bioenergy — the burning of trees, plants, manure, and other living “biomass” for electricity, heating, and transportation — provides more energy than any other alternative energy source. Despite the prominence and rapid expansion of bioenergy, largely due to federal and state grants, loans, and tax incentives, a 2014 Harris poll shows that 61 percent of Americans are unaware of its pros and cons. How much of this lack of understanding is a result of the media’s typically one-sided reporting on the issue? While only 19 of the 80 articles — 24 percent — mentioned the dark side of forest biomass energy, the negative health and environmental impacts of this alternative energy source are widely documented by recent science. US Environmental Protection Agency emissions inventories and peer-reviewed scientific studies demonstrate that biomass energy facilities emit high levels of carbon dioxide and nearly all of the same air pollutants as a coal-fired plant, such as asthma-inducing particulate matter and carcinogenic Volatile Organic Compounds. Biomass energy also consumes a constant supply of trees, the logging of which can degrade and compact forest soils and also cause erosion, silting fisheries and drinking watersheds. While most of the daily news articles turn a blind eye to these negative environmental impacts, others make dubious assertions about the “green” credentials of biomass energy contradicted by large bodies of peer-reviewed science. An article in the Bend Bulletin from Oregon and another in the Wichita Eagle from Kansas refer to biomass as “environmentally friendly,” without any scientific basis for this assessment. 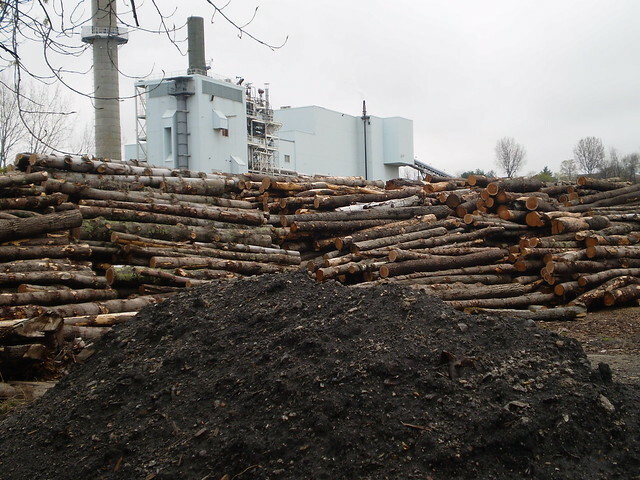 Despite EPA emissions data and numerous studies demonstrating the climate impacts of biomass energy, an article in Michigan’s MLive claims that burning biomass is “carbon neutral,” while the Times Argus from Vermont reports on a biomass facility’s supposed absence of carbon emissions. The News Tribune writes that Washington State officials are seeking to “improve” forests through logging for biomass energy, while Arizona’s Payson Roundup calls forests “dangerously overgrown,” concepts challenged by numerous studies on forest ecology. “There’s a media blackout on the negatives of biomass energy and environmental subjects in general,” said freelance journalist and author J.L. Morin, who writes on energy and environment. The media imbalance on forest biomass energy isn’t limited to daily newspapers. In January 2015, PBS NewsHour ran a segment by William Brangham titled “Running on Renewable Energy, Burlington, Vermont Powers Green Movement Forward.” The title alone makes the assumption that biomass energy — which provided one-third of Burlington’s electricity — is somehow championed by the “green movement,” overlooking the fact that many environmental organizations and conservationists across the US are wary of and/or opposed to most forms of bioenergy. The segment includes only one skeptical viewpoint, and even that individual neglects to discuss the air emissions and forest impacts of the 50-megawatt McNeil Generating Station biomass facility — the biggest polluter in Vermont — preferring to criticize hydroelectric dams. In fact, the only mentions of air emissions or forests were factual inaccuracies that cast the McNeil facility in a better light than hard evidence reveals. Instead of making reference to the particulate matter, Volatile Organic Compounds, nitrogen oxides, carbon monoxide, and dozens of other toxic air pollutants the McNeil biomass facility is permitted to emit on an annual basis — along with over 500,000 tons of carbon dioxide — PBS said that only “water vapor” is emitted from the smokestack. While whole trees are cut and burned in the facility, Brangham reported that the sole fuel source was “scrap” wood. In his editor’s note, Brangham agreed with critics who claimed that PBS gave an “overstated impression of the environmental attributes of the plant,” but the incorrect information had already been distributed to NewsHour’s million plus viewers. Further, the story had been picked up by countless media outlets and blogs and disseminated as memes over social media by a multitude of environmental organizations, few of whom followed up with a correction. The overall impression of the PBS piece on the general public is that biomass energy has no health or environmental impacts whatsoever. While this was most likely an honest mistake on the part of PBS NewsHour, the question remains: why didn’t the prestigious and well-funded news agency do any fact-checking regarding the impacts of biomass facilities, and why were no biomass opponents contacted for the piece? Just because a media source strives for balance in its reporting, doesn’t mean it achieves it. An April Al Jazeera America article by Tom Zeller, Jr. also focuses on Burlington, Vermont’s 50-megawatt McNeil Generating Station biomass facility. This article quotes employees of the biomass energy industry, along with a few apparent critics. Yet a closer read reveals that these ostensibly opposing viewpoints aren’t from local biomass opponents, but from out-of-state entities that don’t necessarily oppose biomass energy and instead advocate for a more “sustainable” form of the technology. Several studies have analyzed US media coverage of biofuels, including corn-based ethanol, but very few have specifically examined biomass power and heating, which typically sources fuel from forests. And while media often has a negative slant when reporting on food-based ethanol, coverage of other kinds of biofuels like forest biomass – the focus of the research for this article – is generally weighted towards the positive. One study scrutinized Alabama newspapers’ reporting on liquid biofuels from 2007-2009, evaluating whether the tone of articles was critical or supportive, and which sources were quoted. The study focused on liquid biofuels like corn- and sugarcane-based ethanol, but also included media coverage of cellulosic-based biofuel (which include forest biomass), and the findings are likely applicable to liquid biofuels and forest biomass alike. Study authors Dyer, Singh, and Bailey found that biofuels coverage at the local and state levels was typically positive and that “potentially important stakeholders were not given a voice.” For instance, the majority of the people interviewed for the articles were business owners or agency representatives, not spokespeople for “civic organizations,” the very individuals most likely to bring up problems with biofuels. Significantly, when Alabama newspapers covered a biofuels project that had the “potential for positive economic impact within their service area,” the reporting was typically more positive than stories of similar projects elsewhere. Reporting from national publications, such as the Atlanta Journal-Constitution and New York Times, was more neutral and likely to be critical of biofuels. Sixty percent of Americans have “little or no trust in the mass media to report the news fully, accurately and fairly,” according to a 2012 Gallup poll. If the public perception of an unbalanced media is accurate, what’s driving this biased coverage? Chris Matera, founder of Massachusetts Forest Watch, whose work has called attention to the impacts of biomass energy, takes it a step further, saying that most media outlets are not operating in the public good and have become “distributors of misinformation,” angling stories to benefit corporate owners and advertisers. “If the public were told they are going to be forced to subsidize a massive increase of cutting and burning of forests to ‘help’ the environment, they would likely object,” Matera said. None of the representatives of the biomass energy industry contacted for this article agreed to be interviewed. In this age of worsening climate change, now, more than ever, the public needs to be informed about its many alternative energy options, all of which have their pluses and minuses, and which must be weighed accordingly. Whatever the reason for the media’s biomass bias, one thing is clear: The public is receiving an imbalanced and unscientific representation of it, one that largely omits the serious impacts on human health and the natural world — the very drivers behind the search for new energy sources in the first place. Josh Schlossberg is a member of the Society of Environmental Journalists and editor for The Biomass Monitor (TheBiomassMonitor.org), the leading publication in the U.S. covering the health and environmental impacts of biomass energy. He lives in Boulder, Colorado and encourages you to contact him at thebiomassmonitor [at] gmail.com or follow him on Twitter at @BiomassMonitor.